bigger target to aim at on long putts. When faced with a long putt, you have to decide what you are trying to do. To avoid three-putting, it is suggested that your target should be a three-foot circle around the hole. What is a Long Putt? By long putts, we are talking of putts outside of the 30-foot range. From this distance most golfers would be happy to walk away with two putts. The opposite view is that whatever the length of a putt, you should always be trying to hole it. Near enough is never good enough. Conventional wisdom says that on long putts your goal should be to avoid three-putting. This is because the chances of your holing these putts is extremely low, whereas the chances of your taking more than two putts is, by contrast, quite high. Rocco Mediate in the book Success on the Green says that his goal for a putt outside of 30 feet is to be inside a three- to four-foot circle. Putting is not just about having a technically correct stroke, although this helps you to putt more consistently. It is about feeling confident in your ability to handle a challenge. When the task appears overly difficult, you are more likely to tense up. On the other hand the confidence you get from hitting to the bigger target than the hole will encourage you to swing your putter freely. The idea of a three-foot circle around the hole works well on a relatively flat green. However, on a sloping green, not all three-footers are equal. A three-foot second putt that is either sidehill, or worse still downhill, is a different proposition to one that is straight uphill. Obviously if you are going to play to a circle, you want to leave the easiest second putt. With this in mind it is not just a case of just lagging your first putt indiscriminately. It is a bit like pool or snooker where the position of the cue ball after the shot is critical to sinking the next ball. It is the view of Dr Joe Parent in his book Zen Putting that the idea of a 'lag' putt to a general area leads to complacency and a lack of sharpness in executing a putt. He states that the ideal lag putt is the one that is mostly likely to find the bottom of the hole, so your intention should be to putt to hole every putt. A practice drill for long putting is to imagine a three-foot circle around the hole. From a distance of 30 feet and beyond, your goal is to leave each ball within this circle. The reasoning is that once you can hole anything within three feet of the hole, you don't have to get your first putt any closer. In fact, some instructors suggest you skip the mid-range putts and devote your practice time to long-range putts and putts within three feet of the hole. Most three-putts are the result of poor distance control on your first putt from long range. If you can lag your first putt within a putter length, there is a good chance that you won't three-putt. 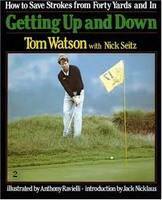 Therefore, I prefer the advice Tom Watson gives in his book Getting Up and Down. He recommends that you hit to an imaginary circle around the hole with a view to leaving yourself with a second putt that is no longer than three feet.